Wrightwood, town without a traffic light. Elevation 6,000 ft. Approximate population, 3,300. Only 15 miles off I-15, it's the easiest mountain drive in southern California. Originally inhabited by Serrano Indians, Wrightwood evolved into a cattle ranch, apple orchard, then finally into a quiet mountain resort community. Wrightwood's history is apparent with buildings from years ago still standing and incorporated into everyday community life. Camping, fishing, skiing, hiking, picnics and plain old FUN! 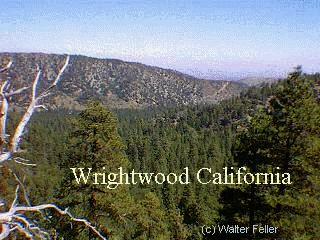 Wrightwood is a land of four seasons, always something to do, always an opportunity to relax and enjoy life. Wrightwood is home to the some of the finest skiing in southern California. Ski Sunrise offers family/intimate and glade skiing while Mountain High provides nearly 20 miles of runs for more experienced skiers. Throughout the Angeles National Forest there are many areas available for snowplay, sledding, and other winter opportunities. Visit, vacation or come live in Wrightwood -- enjoy a taste of our mountain hospitality anytime.